Hubble as seen by Space Shuttle Discovery in 1997. The Hubble Space Telescope entered safe mode over the weekend as scientists figure out what to do after a component failed. But it’s not the end of the famous telescope’s life just yet. It’s frustrating, of course, when a much-loved piece of technology like Hubble shows its mortality. But given the importance of the mission, scientists have a plan for what’s next to keep the telescope functioning before its successor, the James Webb Space Telescope, takes flight. Last night, Hubble Space Telescope deputy mission head Rachel Osten confirmed rumors on Twitter that another of the telescope’s six gyroscopes failed. The gyroscopes allow the telescope, which has been in low Earth orbit since 1990, to sense rotation and stabilize itself. It’s been a “very stressful weekend,” Osten tweeted, but there are plans in place so that the telescope can continue observing the cosmos. 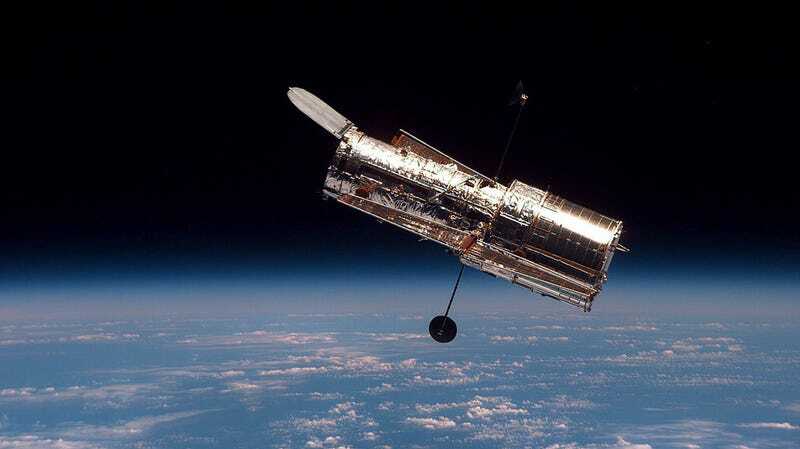 Hubble needs three of its gyroscopes to work in order to continue normal operations. The BBC reports that it has three older and three newer ones. The failed gyro is the last of the older ones. NASA Goddard and Space Telescope Science Institute scientists are attempting to turn another of the newer gyros back on, but it’s acting squirrelly. These gyroscopes have a maximum lifetime and have been subject to replacement during previous Hubble repair missions. The failed gyro already exceeded its lifetime by six months, according to Osten, and there were plans to turn it off months ago. If only two gyroscopes remain, the Hubble team will operate the telescope using only one, in order to maximize the possible observing time. The BBC reported that one-gyroscope operation might place some limits on where the telescope can point, and that it might take longer to move the telescope between targets. Gizmodo has reached out to Osten, the Space Telescope Science Institute, and NASA Goddard for comment and will update the post when we hear back. The aging Hubble still has work to do. Its successor, The James Webb Space Telescope, has faced numerous delays and is now slated for a 2021 launch. But some have suggested another servicing mission to keep Hubble functioning even after the launch of the JWST. Having both telescopes in orbit would be useful, because Hubble detects mainly visible and ultraviolet light, while JWST detects mainly in infrared. There’s no need to worry about Hubble’s existence just yet. The telescope is getting older, and that means that parts are starting to fail, but scientists are working to bring back a third gyro or work with a contingency plan.